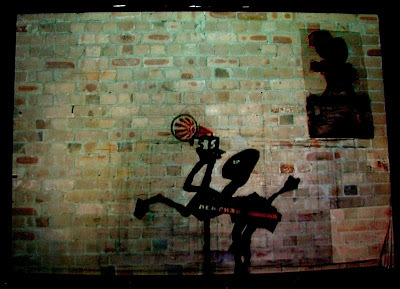 'I am not me, the horse is not mine', William Kentridge's complex and immersive installation of music and moving pictures was easily the most accomplished and memorable work in Sydney's 2008 Biennale. In that context it showed how humour and thoughtfulness can be infinitely more subsersive than leaden irony or confected shock. Installed once more in the peeling masonry of the skeleton of a toolshed on Sydney's Cockatoo Island it reminds us again how Kentridge is one of the major artists at work anywhere today. 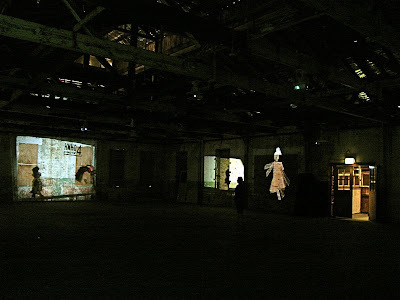 Eight video projectors run separate and distinct animations in a derelict first floor room. Light seeps in through cracks in floor boards and a soundtrack echoes about us, as though a kabaret band is trying to burst through the din of a workshop. Each projection moulds and presses itself onto the irregular surfaces of the building, here wrapping itself around a door frame, there taking on the colour and texture of crumbling brickwork. It is a work to wander within, there is much pleasure to be had working out how each projection is different, how each has its own internal logic and how those might interact with the adjacent piece. The whole work seems to possess the building, and fill it with ghosts. 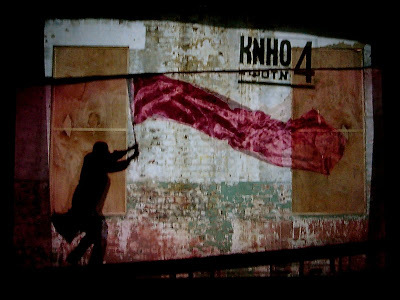 Ostensibly Kentridge's subject is Soviet Russia of the 1930's. His animated collages shimmer in on top of the walls. In one the shadow of a commissar whirls like a cossack whilst on the adjacent screen a Malevich figure performs disjointed acrobatics. One of his sources is Nikolai Gogol's short story 'The Nose', a classic of absurdism. From Gogol one can draw a line to the magic realist response to the Soviet system that we find in writers like Milan Kundera. That line extends through Dimitri Shostakovich, who created an opera around the story and now to Kentridge himself. In the story a Tsarist official wakes to find his nose has not only taken on a life of its own, it has also reached a higher rank. We see the flight of an anthropomorphized nose on one of the screens, on another Eisenteinian collage and montage fleshes out the story. It is never quite narrative but the surrounding fragments have a cumulative effect whether you are familiar with the details of the source or not. Many familiar Kentridge techniques and themes are here, the fluid charcoal animation that makes us feel the image is being drawn rather than projected, the processions of characters that might be in a parade or a 'dance of death' and the continual metamorphosis between people and objects. It is a rich visual spectacle that has more depth than usual, whilst sometimes the animations seems like shadowplays or cut-outs occasionally a flag might wave or a skirt swirl and the figures come off of the wall. 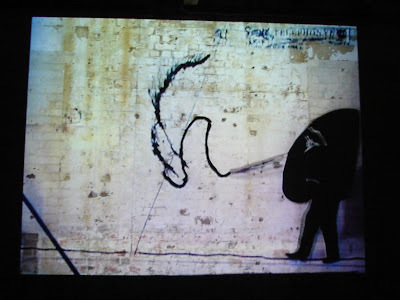 That sense of the artist's hand is always there in Kentridge, his stop motion animation and draughtsman's hand give his work a expressive quality that prevent it from being mere polemic. The projection onto brickwork gives the constructivist geometries a rough vulnerability. It portends a future when their makers would find that the mechanical positivism of the revolution turn on them. At one end of the room is a projection of extracts from the transcripts of the 1937 show trial of Nikolai Bukharin, a voice of humanist socialism within Stalin's regime. The extracts read like Ionesco but they are harder to laugh at, as we know that the trial ends, as it was always supposed to, in execution and the final silence of dissent. It is this that reminds us that the co-option of modernism by totalitarianism is a continual theme in the twentieth century and it makes Kentridge's work hover on the cusp between tragedy and farcical comedy. There is something untidy and chaotic in Kentridge's work, this is more important than a stylistic glitch. Modernism was crushed under Stalin and it is in that context that we ought to remember how shameful the willing seduction of so many artists by totalitarian aesthetics is. The elimination of the human from art is every bit as sinister as it sounds. That's why there is something beautifully edifying in seeing that order stumble and smudged in Kentridge's projections.